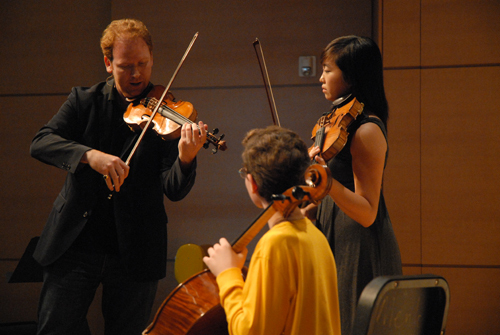 Music@Menlo’s ninth festival, celebrating the music and legacy of Johannes Brahms, unfolded in unique and sometimes unexpected ways. An unprecedented number of major artists made their festival debuts, each bringing fresh musical perspectives not only to the stage but also contributing to the many educational forums that continue to exemplify Music@Menlo’s spirit of curiosity and exploration. Attendance hit an all-time high, and the proximity of next season’s milestone year fueled the sense of communal exuberance. Although this festival, since its inception, has fallen on basically the same dates, and has replicated a predictable event structure, it somehow never seems routine. Perhaps it is the changing thematic focus that makes each summer a fresh adventure, plus the presence of a new crop of young students which tests our abilities to communicate and identify musical and technical issues that need to be addressed. Certainly, as much as Wu Han and I have researched our programs and are familiar with our content, we find ourselves in as much of a learning mode as anyone who throws themselves into the Music@Menlo mix. One of the first revelations we had near the outset of the festival concerned this summer’s title Through Brahms. Originally conceived as a phrase that described the evolution of music passing through the hands of the great composer, we came to realize that this title contained an additional meaning: music written during, before and after the time of Brahms could be heard with deeper understanding using Brahms as a kind of musical lens, through which to hear other music. 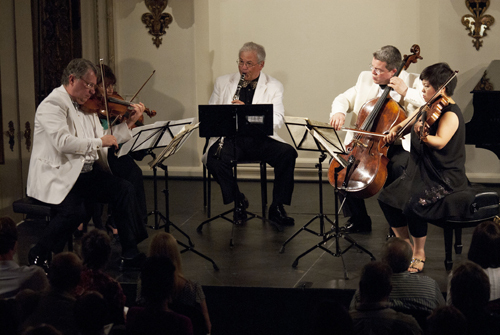 And indeed, the festival presented a wide variety of such music, from a trio sonata by Bach to the piano quintet by John Harbison, all of it pulled together by the magnetism and intensity of Brahms. 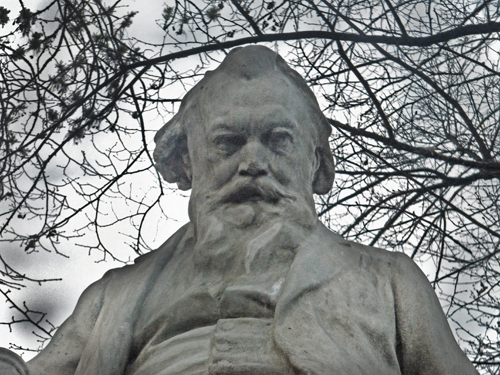 Of course, one can find in the works of Brahms’s musical heirs his same dedication to “rightness” of compositional technique, his uncompromising commitment to quality. But it was just as interesting to listen, for example, to the “Notturno” of Franz Schubert, knowing that music of such magical, transcendent quality would blossom into the Romantic age, reaching its culmination in the otherworldly essays of that Brahms composed in his twilight years. It would be impossible to select a single highlight of the festival, but one facet of this festival that would certainly be worth singling out was the influx of brilliant new artists, many of whom we had been trying to secure since our first season with no luck until now. So many of them are such demand that can pick and choose any summer concert dates they desire. Many of them also hold long-time loyalties to other festivals. But somehow, the stars lined up for Music@Menlo this summer, and all of a sudden, there appeared faces we had waited almost a decade to see. Yet, even before the concerts began, Music@Menlo 2011 experienced a “first” in the opening night Encounter: Patrick Castillo, who joined the ArtistLed team in New York in 2000, and who has, as Artistic Administrator, been instrumental in building the festival, finally assumed the coveted role of Encounter Leader, taking a capacity crowd through a brilliantly conceived and seamlessly executed overview of the life of Brahms. No one was more qualified to deliver this lecture, as Patrick has not only been the author and narrator of the Festival’s AudioNotes series, but has, since the festival’s inception, worked with and guided Encounter Leaders to successful presentations, collaborating and assisting such luminaries as Robert Winter, Robert Greenberg, Ara Guzelimian, R. Larry Todd, and of course the late Michael Steinberg, for whom the series is now named. The success of the event was a personal triumph for Patrick, and feather in the cap of the festival, which can take some credit for having helped to groom a brilliant and charismatic arts leader. Friday night’s opening concert brought to our stage the eminent violinist Cho-Liang Lin, a close friend and colleague of ours for over twenty years. 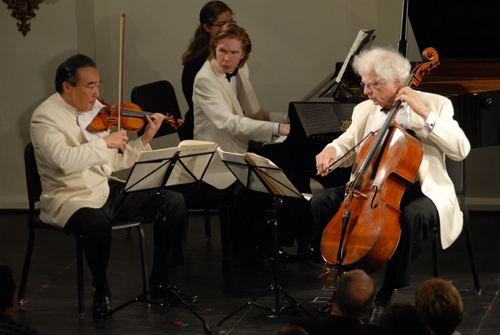 We have played almost countless concerts with the gregarious and popular “Jimmy”, including a recital tour with Wu Han in Japan, trio concerts at the Aspen Music Festival, a Ravel duo performances at the Santa Fe Festival, and of course numerous concerts at La Jolla’s SummerFest, once our own festival, which Jimmy succeeded us as artistic director in 2001. It has been Jimmy’s commitment to his own busy festival that has kept him from Music@Menlo, as the dates are practically identical, but thankfully this summer the timing allowed him to squeeze in a visit prior to his own festival. It was a pleasure to perform Schubert’s Notturno with him and Finnish pianist Juho Pohjonen, and also to hear him in a magnificent performances of Brahm’s B major trio, with Juho and veteran cellist Laurence Lesser. 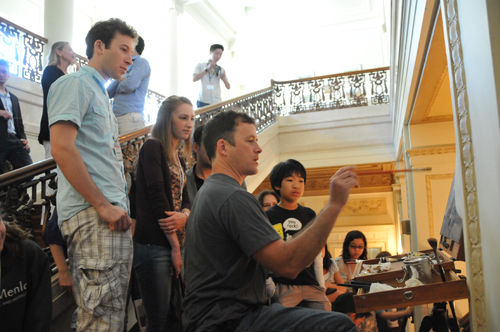 It was also a revelation for our audience to experience the spectacular gifts of Juho as a collaborative artist. Last summer he flew from Helsinki to perform a stunning solo recital as a last minute cancellation. It was a joy for Music@Menlo this season to have this rising star on site for more than one concert, and to allow him the opportunity to work with our young students. We reconnected with Juho just two short weeks later in New York, where he gave a highly-praised performance of Mozart concerto K. 488 with the Mostly Mozart Orchestra, and sublime solo recital of Mozart and Haydn in the Mostly Mozart Festival’s A Little Night Music series. From the earliest days of the festival to the very end, we were lucky to have with us one of the most talented young musicians we have ever met: violinist and violist Yura Lee. Having become acquainted with her as a member of Chamber Music Society Two, we have been time and again astounded at not only her seemingly effortless profiency on both instruments, but also her fearless pursuit of challenge, her probing musicianship, and a maturity of conduct that belies her years. In repertoire as varied as Clara Schumann and Enesco, Yura excelled on both violin and viola, making herself an essential presence in the festival. As I write, she has joined us in northern Germany at the Mecklenburg Festival, having squeezed in the Bridgehampton Festival between the end of Menlo and now – a scheduling feat that was amazing even to us. A musician of major and ever-growing stature, violinist Daniel Hope, first known to us as the final violinist of the Beaux Arts Trio, found a few days in his hectic schedule to visit us for the first time. Daniel is a musician who wears many hats: besides enjoying a performing career as soloist and chamber musician, he is a prolific author (four books to date), a television personality with his own music talk show in Germany (he is bilingual), a skyrocketing recording artist (with an exclusive contract with Deutsche Grammophon), and a music director of the Savannah Music Festival and recently the Mecklenburg Festival, where we are now and where we will perform together tomorrow evening. Daniel gave us a fantastic Carte Blanche concert which looked at the music of Brahms’s time through the lens of one of the composer’s most important collaborators, the violinist Joseph Joachim. It is impossible to keep up with the pace of Daniel’s activities; his creative urge and exuberant spirit seem to know no limits. You can get a good idea of what he’s up to by looking at his dizzyingly impressive web site. 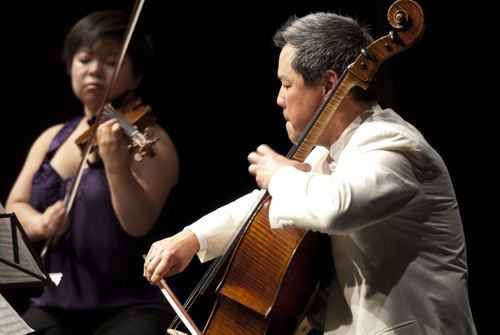 Another important addition in the festival’s growing cello family was Eric Kim, a familiar and much-loved performer to audiences around the country, and especially in Cincinnati, where he held the symphony’s principal cello position for 20 years. 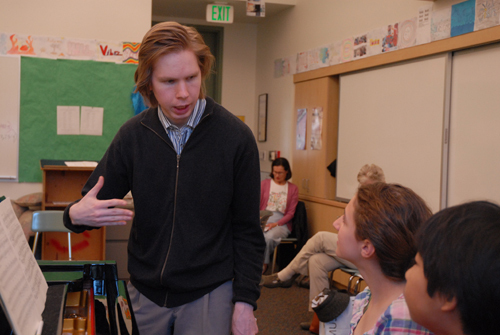 A highly respected teacher as well, Eric is a central figure at the Aspen Music Festival every summer, where he leads the Festival Orchestra’s cello section and works with a high-end class of students. He is now a Professor at Indiana University’s Jacobs School of Music. Eric and I have enjoyed specially close partnerships, among them a Bloch Schelomo in Aspen with me as soloist and Eric leading the cellos, and a tour performing the Brahms sextets with violinists Pinchas Zukerman, Itzhak Perlman, Mark Kaplan, and violist Cynthia Phelps. Eric distinguished himself in Menlo especially with an elegant rendition of the first cello part of Brahms’s demanding B-flat sextet, and we hope his busy summer schedule will allow him to return in the near future. A significant contribution was made to Music@Menlo this summer by a pianist we had all known, but whom we had yet to experience in concert: pianist Lucille Chung. A distinguished soloist and collaborator, Lucille took on the hugely demanding challenge of John Harbison’s Quintet, as well as a duo piano performance of Brahms’s quintet with her husband Alessio Bax. 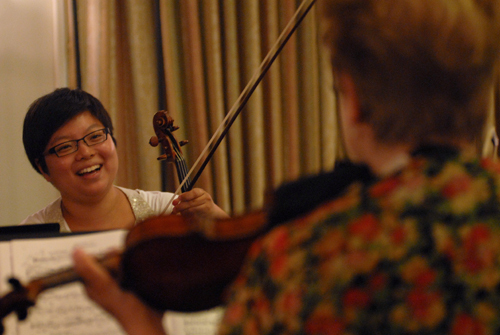 Music@Menlo had an historic season for Encounters, with half of the Encounter Leaders making festival debuts. 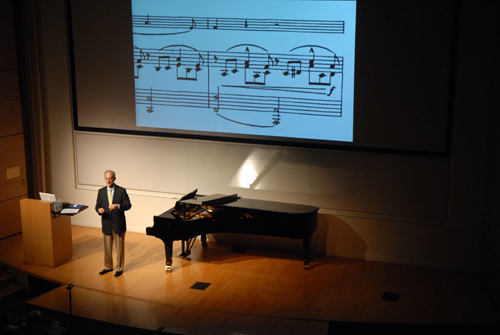 Michael Parloff, retired principal flutist of the Metropolitan Opera Orchestra and now music director of the Parlance Chamber Concerts series in Ridgewood, New Jersey, came to the festival with the delicate mission of explaining – as well as it can be understood – the complex relationships between Brahms and both Robert and Clara Schumann. We had gotten a strong hint that Michael would thrive in a full 2-hour spoken format, having heard him deliver eloquent pre-concert speeches prior to his own series’s concerts. Michael, who is a phenomenally gifted educator, was thoroughly prepared, handled the subject with probing grace, and was an instant success with our discriminating audience. I was approached several times during his intermission by listeners who hoped he would return. He will, and we look forward to many years of collaboration with this brilliant, charismatic musician. A highly-anticipated event of the season, our vocal program titled Songs of Love, brought together a top-notch quartet of singers, three of whom were making their festival debuts: tenor Paul Appleby (right), baritone Kelly Markgraf (near right), and soprano Erin Morley. Holding the group together was Menlo favorite, mezzo-soprano Sasha Cooke, also Kelly’s wife, who visited this summer as a family with their new baby. 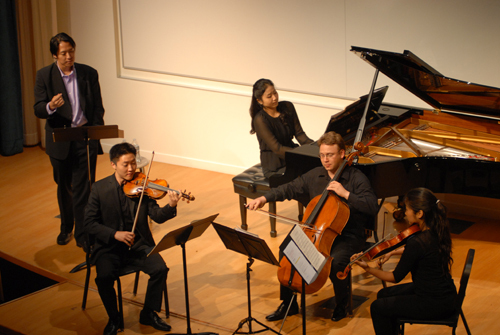 The quartet, accompanied by the piano-four-hand team of Wu Han and Gilbert Kalish, were teamed to perform Brahms’s Liebeslieder Waltzes, Schumann’s Spanische Liebeslieder, and other works as individuals. 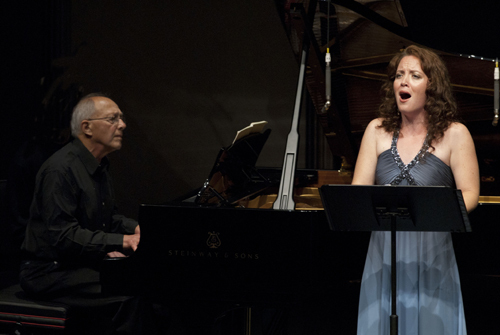 Sadly, Erin lost her voice just before the concert, but the event was rescued miraculously by soprano Katherine Whyte who flew in from Toronto on the day of the concert, and performed all the works, even Berg’s Seven Early songs. This is how heroes are born, and, in this performance, yet another artist crossed the Music@Menlo footlights. 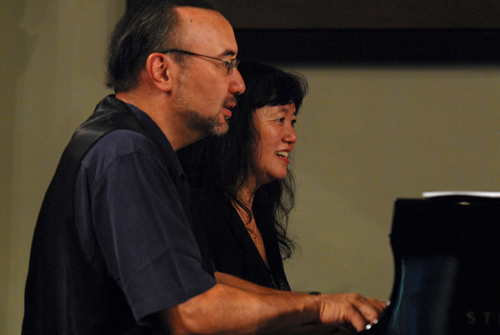 A huge burst of energy arrived mid-festival in the form of pianist Jon Kimura Parker. If there was ever an artist who seemed as if he had born at the festival and there all the time, it was Jackie. Insatiably curious, overwhelmingly generous, unbelievably gifted and irresistibly charismatic, Jackie endeared himself to the festival community at every occasion, throwing himself into coachings, rehearsals, parties and impromptu encounters with unbelievable gusto. He also delivered stunning performances of four-hand Brahms with Wu Han, and powerful yet pristine renditions of Brahms’s C major trio with me and Elmar Oliveira, and Brahms’s clarinet sonata with David Shifrin. However much time passes before Jackie returns, it will seem too long to me. Visit Jackie’s hugely entertaining and informative web site. 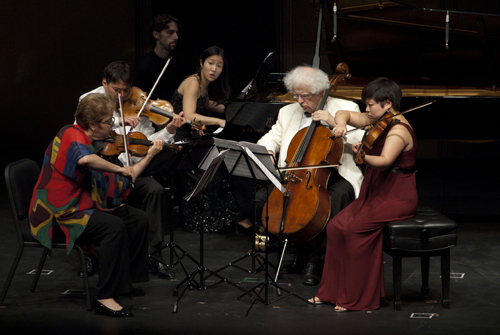 The festival’s final performances were graced by the presence of veteran artists who brought to the stage years of tradition, experience, insight and passionate commitment to chamber music. Among them was a musician whom we consider to be one of the most gifted we have ever known: clarinetist David Shifrin. Artistic Director of the Chamber Music Northwest festival for thirty years and our predecessor as artistic director of the Chamber Music Society of Lincoln Center, David’s sublime and magical music making put him in a class by himself as interpreter of the clarinet’s most important repertoire. He was the Emerson Quartet’s choice for our recording of the Mozart and Brahms quintets, and recently favored ArtistLed with his performances of trios by Beethoven, Brahms and Bruch – our most recent disc to be released this October. David had yet to make it to Music@Menlo until this year — a result of his being occupied with his own festival. We could not have been more proud to see him enjoying himself in the company of our musicians, students, and audience members. His heartfelt performance of the Brahms Clarinet Quintet, one of the masterpieces of the composer’s final period, closed the festival with an artistic experience of the highest quality. Without a doubt, at any festival, it is the depth and content of the ancillary offerings that go far to define its identity. Because the soul of Music@Menlo is education, with its Institute as its core, a seemingly endless array of creative, fascinating events offers opportunities for discovery every summer. Many are planned months in advance, while others spring up spontaneously during the festival. So many artists become inspired to contribute more than their performances when they see the excitement of learning that permeates the festival. So below, I’ll describe just a few of the many events that occurred this summer which gave Music@Menlo 2011, to a large degree, its incomparable spirit. “Talk, talk, talk” one might say about Music@Menlo. Indeed, we are heavy on the spoken word. How else to provide meaningful and enlightening context in which to hear our concerts? But sometimes, simply hearing, absorbing, wondering, and using the imagination is as valid a musical experience as any. 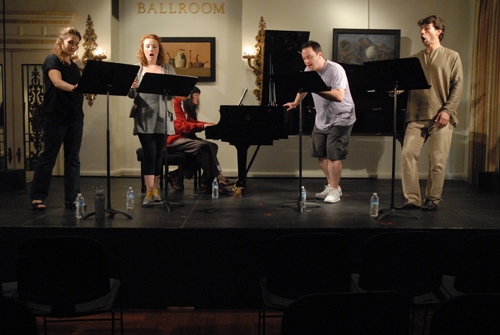 The Listening Room, the brainchild of Artistic Administrator Patrick Castillo, offered the curious four sessions this summer, during which whole recordings were played in Martin Family Hall for people to simply sit and listen. 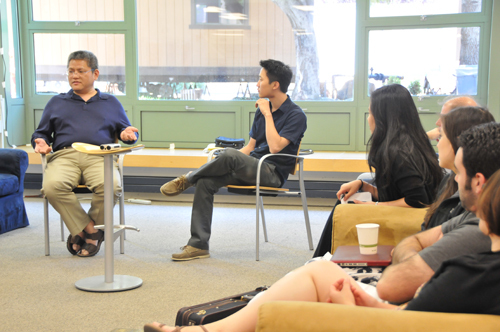 Patrick’s choice of music is often surprising, sometimes provocative, always engaging, and the Listening Room, over the past two summers, is fast emerging as a Music@Menlo tradition. In addition to our scheduled Encounters, master classes, Café Conversations, and Listening Room sessions, a new festival component emerged this summer that allowed our students even greater access to artists and information. As yet unnamed, the daily 2-2:45 sessions gathered either some or all of our Institute students, plus curious on-site, die-hard rehearsal listeners (there are many of them who spend whole days on campus) to hear presentations by those festival participants whose enthusiasm for sharing knowledge was unstoppable. 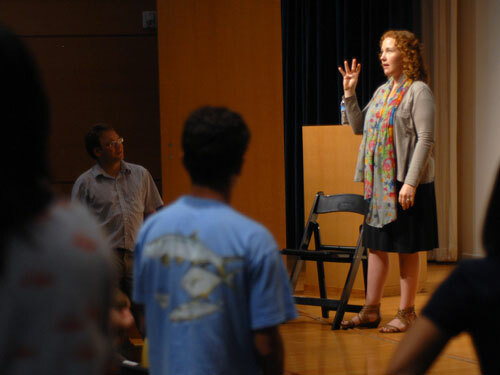 In one such talk, mezzo-soprano Sasha Cooke treated us to an explanation of vocal technique, complete with astounding demonstrations, that gave us string players especially a better shot at sounding like great singers – something we all aspire to. In another of these sessions, festival recording producer Da-Hong Seetoo shared his knowledge and experience as not only a recording engineer, but also as a violinist of the highest caliber, helping our young musicians to someday face the daunting challenge of making good recordings. Later in the summer, Da-Hong, at the urging of our International Performers, generously gave them a sample recording session, putting them under his microphones and his scrutiny for samples of the repertoire they had learned during the summer. Begun by Michael Steinberg during his first season at the festival, the annual Poetry Reading event is hugely popular with students, artists and audience. 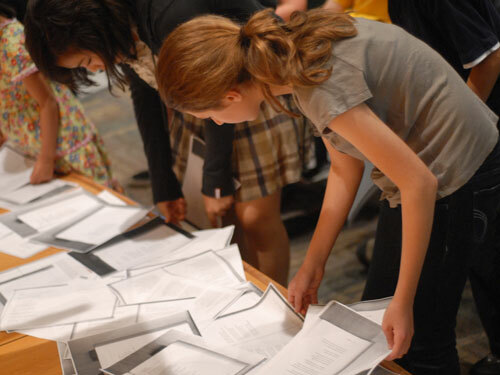 The format is simple: the session leader (this summer Patrick Castillo and Jorja Fleezanis) select and copy a huge number of poems, lay them out on the stage of Martin Family Hall, and invite the audience to select poems they would like to read. After selecting their poems, the readers return to their seats to study a bit, and, when they feel they are ready, raise hands, come to the stage, and read. One might ask: what does reading poetry have to do with a music festival? Well, I might counter with the question: is reading poetry really different than playing music? In both cases, we are called upon to read masterful scripts, to interpret, bring out meaning, express ideas, and engage an audience. For our students, the act of “performing” a poem gives them a chance to realize how close playing music is to telling stories, how ideas can be powerfully expressed with words as well as notes. Without exception, every summer, a handful of students who had perhaps been shy, or somewhat closed, will blossom like flowers as they read, revealing depth of feeling and understanding for the first time at the festival. For these students, the poetry reading can serve as a great step forward, after which they become ready to bring a new level of expression, in public, to their music-making. These poetry readings are multi-dimensional, containing humor, mystery, provocation, and often profoundly moving moments as the delivery of a very young person goes straight to the heart. I rest my case. One of the most unusual and magical moments of the festival came during Alessio Bax’s phenomenal Carte Blanche recital in Stent Family Hall. As Alessio had the previous summer, he astounded the packed house with another display of utter mastery of the instrument, coupled with thoughtful, tasteful music making. 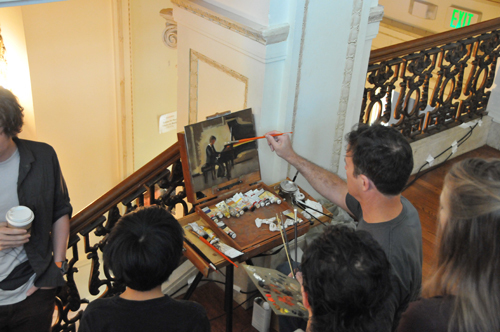 As if this weren’t enough to absorb, those of us who listened to concerts on the music room’s grand staircase were able to watch John Morra, the festival’s Visual Artist-in-Residence, create a portrait of Alessio at the piano. No one who saw him paint and heard the concert would deny that the keyboard magic happening on stage was duly echoed by the brush work on the staircase. Each of John’s exquisite paintings is a technical and conceptual masterwork, and having had the chance to watch one in creation was truly a privileged and rare experience. We thank John for his generosity of spirit and for the sublime contribution he made to the festival. 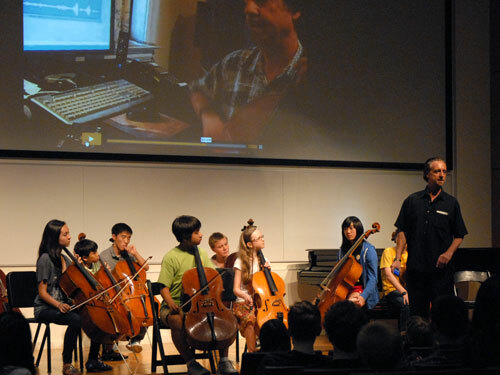 Knowing that there was a good deal of curiosity going around about my recently-completed series of Cello Talks, I volunteered to lead a guided tour of the Cello Talks web site. Never having done this before, I decided it might be interesting to do some teaching directly off the videos, asking students to do what I suggested in order to practice various techniques. I dare say that perhaps none of them had ever tried to regulate their vibrato to the beat of a metronome. The one-hundred Talks contain a lot of information, way too much to digest in a one-hour overview, but I hope that my introduction to the site will lead some to explore further, and of course, help them improve their playing. That’s what the Cello Talks are all about. As euphoric as our Through Brahms summer was, there was a palpable underlying excitement, especially among long-time festival attendees, about the approaching tenth anniversary season. Anticipation is high: people are plotting ways to learn the programming and wondering what might be special; artists wonder who will be invited; the public and the press are asking if there will be significant change in the second decade of the festival. What can we say? Music@Menlo’s tenth anniversary has been deeply thought over, explored, and carefully decided. It will be, for sure, a summer of celebration which will remind us all why Music@Menlo started in the first place.